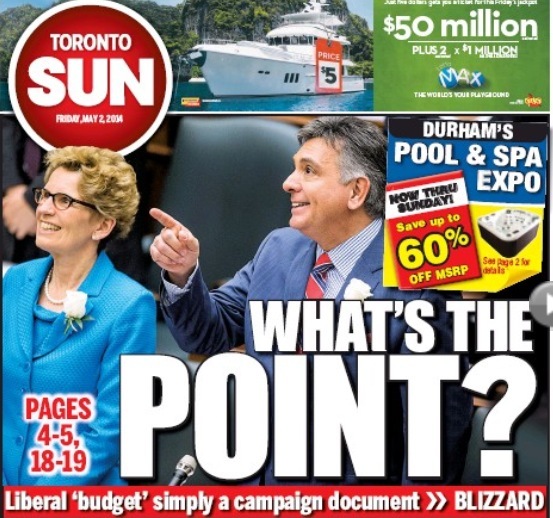 In turning her back on the Liberal Party’s proposed budget, Ontario NDP leader Andrea Horwath has whipped up a tornado of controversy by triggering a new election to be held in less than two months’ time. Depending on who you ask, this is either the bravest or the most reckless thing she could have done. One thing that’s certain is that it was a big surprise. Reactions on the left include disappointment, bewilderment, relief, and excitement. Accept the bitter pill of a flawed, bloated budget from a government that has botched things very badly even though leadership has been replaced. Turn down the budget, thus triggering an election and exposing ourselves to the possibility that we could end up with an even more damaging administration in charge. We’ve been here before. Andrea Horwath is damned if she does and damned if she doesn’t. Ultimately, the fundamental challenge facing progressives isn’t the NDP’s refusal to cooperate with the Liberal government. What we really need to be concerned about is why we don’t have a bigger base of support while the conservatives do. It’s not a pleasant subject, but it has to be addressed if we’re interested in the long term well-being of all Ontarians. A budget to please or appease? Many progressives were taken in by the promise of Wynne’s budget while failing to recognize that this is about much more than the budget itself. In addition to the question of whether it offers the right ingredients, there’s also the question of whether it’s realistic. Most importantly, would it have been implemented by the administration making these promises? The problem is that Wynne’s government has no credibility at this point. The budget may sound like a great deal (it’s not), but it never could be under the execution of an irresponsible government regardless. It’s like a big, beautifully wrapped gift that’s too heavy to carry home. The NDP is taking a huge risk by triggering a new election, but whereas its outcome is uncertain, we know exactly where that budget would lead. When we peel back the cellophane wrapper, we discover that this ‘gift’ is essentially the same one we got last time. How long are we going to compromise our principles out of fear of the right wing? What I’m really struggling to understand is how NDP types could be suspicious of Horwath while trusting Wynne’s Trojan horse. The left has to come together on this and take a good hard look at what has worked, what hasn’t, and reconnect with the people. We know that a substantial proportion of working people act against their own best interest when they vote Conservative or Liberal. We need to start articulating that not only by criticizing those budgets and platforms, but by building a plan that actually works. The neoliberal agenda has placed a spell on us with its enchanting incantations but it has failed to make meaningful progress. The Ontario Liberal Party is now widely reviled from all sides. They’re so deeply entrenched in a culture of incompetence, waste, and corruption that people are incensed enough to veer from their traditional voting patterns. If Tim Hudak didn’t come off as such a mediocre-minded slimeball, the NDP probably wouldn’t have taken such drastic action. I suspect his lack of likeability isn’t helped by Stephen Harper’s reputation as a cold, calculating sociopath. Harper has done considerable damage to the Conservative brand in general, just as McGuinty and Wynne have done for the Liberals. Could this play a part in the election outcome? Right-leaning voters who desperately want change but aren’t married to the Conservative culture are more likely to overcome their uneasiness about the NDP if they see that they aren’t acting like petulant, out of touch, impotent utopians. Add to this the extra points that Horwath wins for distancing herself from large private sector unions like Unifor and the Ontario Federation of Labour that urged her to side with the Liberals. We saw that under Jack Layton, the party articulated popular priorities very well and was able to seize on favourable conditions. If the NDP demonstrates once again that it has a renewed sense of purpose and is just as fed up as the rest of Ontarians – and serious about doing something about it – there’s a chance they might attract supporters we haven’t anticipated. Even for those voters who still won’t be ideologically swayed by the NDP, Horwath will have earned nods for showing some refreshing nerve and integrity – something many people have been craving badly under the Liberals. She managed to hand them a way out – something that Hudak, Wynne’s most vocal critic – could not. He’s eating his words now. Under Horwath, the Ontario NDP is now projecting an image that says the era of centre-left patronage is over, and it’s willing to risk losing ground to the right in order to defend accountability. They’re not afraid to step into the ring alone. After all, who wants to root for a contender that doesn’t really want to fight? It’s unclear how much respect Horwath might gain or how much currency that will have, but the election is only eight weeks away. 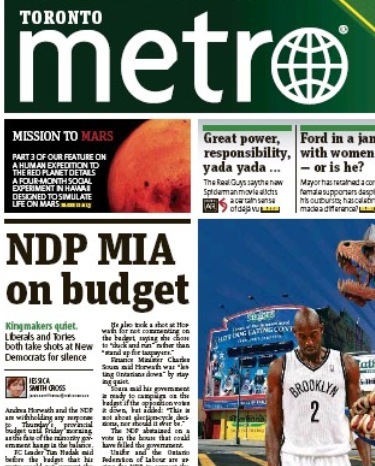 That doesn’t leave a lot of time for Hudak to shine or for Wynne to gloss over the embarrasing rejection. People are sitting up and taking notice, but the key to Horwath’s success lies not in whether the people are paying attention to her, but whether she’s paying attention to them. If this curve ball doesn’t inspire Ontarians to decide that voting is more interesting and worthwhile than watching TV, I don’t know what will.